Whether your playground is themed or not, the Benny Bulldozer Fun Bounce is a fantastic addition to the playground. 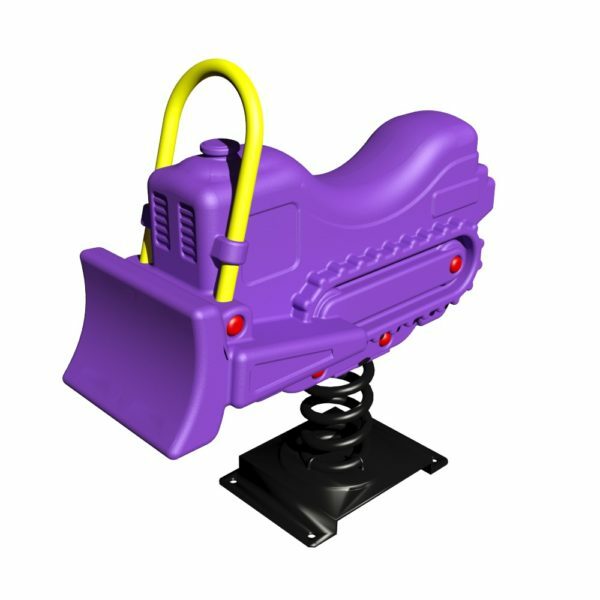 This little playground spring rider can be enjoyed by children between the ages of two and five, and is shaped like a real bulldozer. Not only does this prove a popular feature of any playground, but its shape can also help your children understand the purposes of different objects in the world around them, such as machinery and vehicles. This spring rider is designed to imitate a bulldozer, and has gears and scoops on the front, allowing children to make believe that they are driving a real piece of machinery, plowing their way through the playground! With a heavy-duty, powder-coated coil spring and mounting plate, you can be sure that the device is firmly set into the ground and will be able to withstand the elements of the outdoors. You can either mount the piece straight into concrete, or use J-bolts to attach it to the ground. Safety Zone – 13' 2” x 14' 11"
Critical Fall Height – 2' 4"